Well, it's about time I post this simple yet delicious recipe. Tonight I went to the grocery store to pick up a few things for dinner and I forgot to pick up some tortilla chips for our Mexican meal. I remembered the corn tortillas for the tacos, though, so I figured, "Well, I guess I'll have to fry up some of my own." It's a super simple recipe; so simple that I hesitate to even call it a recipe. If you've never had homemade tortilla chips, though, and you don't mind frying, you ought to give these a try. They're nothing like Tostitos, and because they're made with actual tortillas, they taste authentically Mexican. Plus, if you're on a low-sodium diet like I should be, these are a great way to go for a Mexican dinner side dish. They're also a good way to use up older (but not disgustingly old) corn tortillas. They go great with guacamole, salsa, chile colorado burritos, or just by themselves. Place the wire rack in/on the cookie sheet. Place a double layer of paper towels on top of that. Heat oil in frying pan over medium-high heat. You can either check the temp with a thermometer (ready at 375 degrees) or put in a little piece of tortilla when you think it's ready. Be careful to not let the oil get TOO hot. 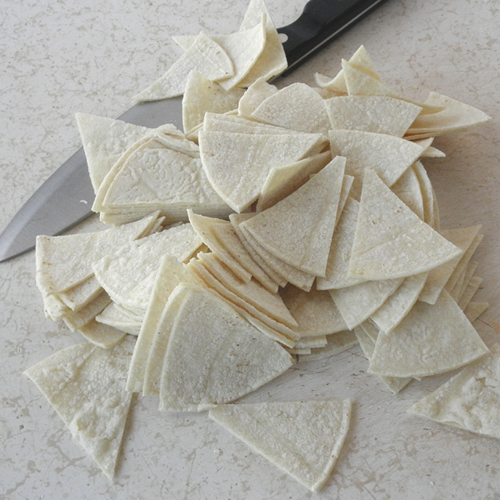 While oil heats, cut tortillas into eighths, like you'd cut a pizza. When oil is hot, fry enough chips to cover the oil with a little overlap, turning a time or two until both sides are a deep golden brown. 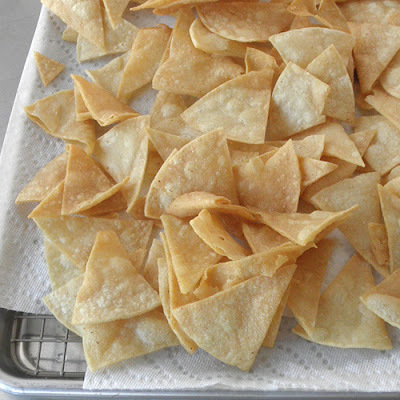 Remove fried chips to prepared cookie sheet and sprinkle immediately with salt. 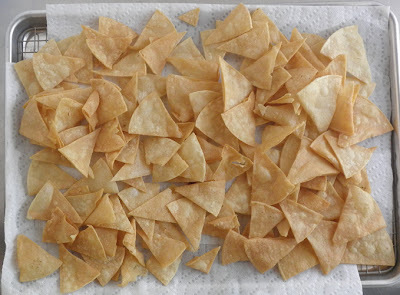 Repeat with remaining tortilla wedges. If you have any left over, seal in an airtight container for up to a week, I suppose. Makes a lot of chips.